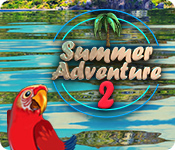 Summer Adventure 2 is rated 3.9 out of 5 by 9. Rated 5 out of 5 by Redau from Just Bought This Game It's right up my alley right now, very bright, very cheery and downright helpful when you are constantly wiping away tears/sweat/aches. Outdoors work tends to do the above so tis great to finally have a game that you can sit with for 5 or 10 minutes and not want to throw a tantrum or rip your hair out. Well done guys! As in Oliver Twist "Please, Sir, I Want Some More"!!! Rated 5 out of 5 by iou001 from This is NOT a cluttered game. I love this stress-free game. I played the demo for 10 minutes, exited out of the game and bought it. I love the relaxed mode so I can get up and get something to drink and not worry about the clock running out. I love the hidden areas that have items hiding in them. The graphics aren't perfect but they're recognizable and don't hurt your eyes from being too bright and too cluttered. If I had one complaint it would be the scoring. I found everything in less than 2 minutes and only got 1 star. Either don't have scoring in the relaxed mode or give better scores. This is a game I'll enjoy playing with my grand kids. I didn't know about Summer Adventure (1) but I'm going to buy it too. Rated 5 out of 5 by Bonnie241 from worth it This is a relaxing fun game although simple. I am enjoying it. Rated 4 out of 5 by CyndiLouWho2 from Perfect therapy for older folks If you're a seasoned gamer who's used to glorious graphics, intricate HO scenes and a riveting adventure, then you won't like this game. Summer Adventure 2 has none of those features. However, my parents, who are both in their early eighties, absolutely loved this game when played in relaxed mode. The graphics are simple and easy on the eyes. Finding the simple hidden objects and playing the mini games in-between entertained them and got them away from mindlessly watching TV. While I myself did not enjoy playing Summer Adventure 2, it's great thought and coordination therapy for older folks. I also think kids who are old enough to read would enjoy it as well. Rated 4 out of 5 by arnold1049 from LOTS OF VARIETY This is a great HOG with lots of other puzzles included that provide a lot of variety to break up the HOS. I played the demo to the end and reached level 13. Forgot to check how many levels there were. 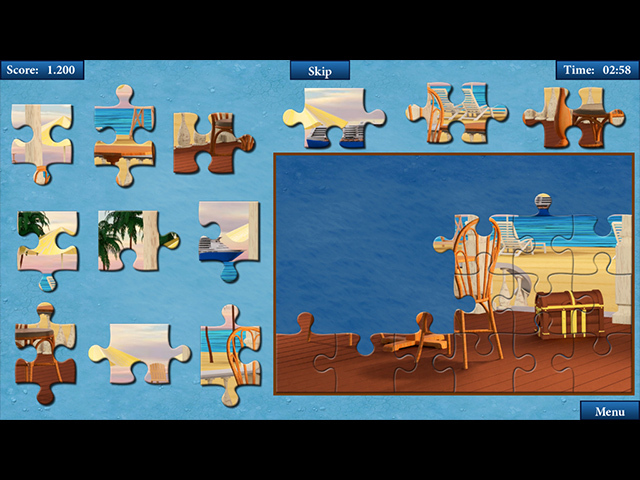 The additional puzzles that I encountered included Match 3, jigsaw puzzles, search puzzles, and placing items in the right order. Another great addition was a HOS within the main HOS. You have to find the sparkles within the main HOS that allows you to go into the embedded HOS. Having the option to play timed or untimed modes is always a hit for me, as I always play the relaxed mode. There are hints available but not sure how fast they recharged. I rarely needed more than one hint for any scene. A magnifying glass was also available which really helped in finding the items. The graphics are bright and the items are well hidden, making the game challenging. The only con I have for the game is there is no explanation on what needs to be done to earn 3 stars. I never got more than one star for all the levels I played. Since I played the relaxed mode, I think that would not affect earning stars. If using a hint is one of the criteria, there were many levels that I did not use a hint, yet still only got one star. This was frustrating and reduced some of my enjoyment of the game. If you don't know what you are trying to achieve, it reduces the game to a pointless enterprise. If not for this, I would have given it 5 stars. But I still recommend this game and have purchased it immediately. Rated 3 out of 5 by splash1234 from Try harder! If you want us to buy a game try making it more appealing. Better graphics, change the blasted music now and then!! And a bobby pin is a bobby pin not a hair grip. I've never even known it to be called a hair grip. In one scene a crayon looked like a short pencil. NOT good graphics. Try again! However, many people will enjoy it, it is relaxing. Give it a try. This is only my opinion. Rated 2 out of 5 by Berry1273 from Crudely drawn graphics and annoying music. This game is a cheap version of the Big City Adventure games. I played for 30 minutes and that is all I could take. The graphics are very cheap looking, the music is just sounds not really music, and there is no story at all. I really would like to see a change from the morbid occult related games that seem to be always offered, but this was not the answer. Very dull game. Rated 2 out of 5 by pennmom36 from Zzzzzzzz...... Summer Adventures 2 is just as exciting as Summer Adventures 1. 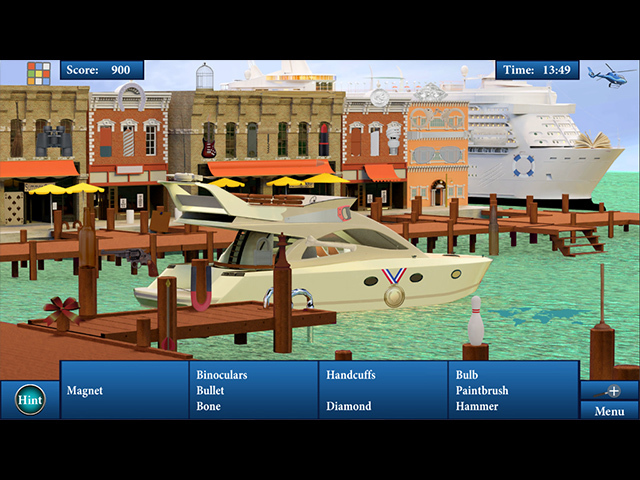 It is a simple Hidden Object Game that mirrors the popular "Vacation" games, but it isn't even close as far as entertainment and fun factors go. The graphics are large and very basic, not to mention unappealing, and some objects are hard to recognize what they actually are because there are so few details, even when you use the Zoom Magnifying Glass feature! The Hidden Object Scenes can be played in a Timed or Relaxed Mode, and you can earn up to 3 Stars, according to the amount of time, but it doesn't seem to penalize you for misclicks or using the Hint feature. This is an old-fashioned Listed item find HO style and each scene has a zoom zone that contains the final 2 objects, but there isn't an indication for the zoom zone areas so I had to guess or use the hint to find it. I also had problems when zoomed in, I couldn't click on objects when zoomed in because every time I clicked the scene would zip over to another area! The items to find are not proportionate, a tie may be normally sized sitting next to garlic the size of a basketball. 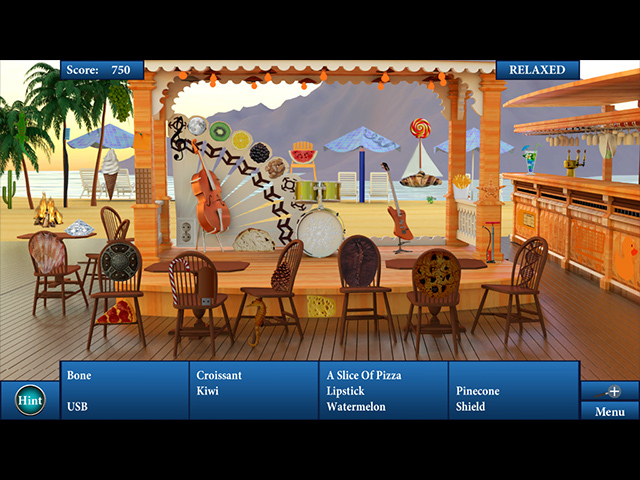 After each Hidden Object Scene, there is a simplistic mini-game available, such as a 24 piece Jigsaw Puzzle with no rotating feature, a game of Pipes where you click to rotate square tiles to connect a path of pipes, a group of 2 or more identical image Match 3 game or a word search variation with fruit images instead of actual words, which had to selected from beginning to end, even though selecting it from end to beginning is the same thing. The HO scenes are just plain and boring. The puzzles are far too easy so it becomes repetitive very quickly, I'll stick to my Cruise or Park Vacation and pass on this one.